Tues 12/2 Barnum Showcase within our own class, sharing the final script and “beta version” podcasts among ourselves. Thurs 12/4 We’ll prep for the Poster Day presentations and work on getting the podcast series up and running on Podbean. All project parts are due. Our last day of class is Tues 12/9 Course Reflections are due, and we will display our podcasts at the First Year Experience Poster Day from 2-4 in the May St. Building (we’ll use the classtime for setup as needed). A musical now on Broadway based on the life of Daisy and Violet Hilton. Plus: a whole hour-long discussion show about why side shows are BACK in the cultural moment, right now, last week on NPR. Take a listen. Our last course unit is devoted to studying one iconic, enigmatic person who’s the key to everything we’ve been doing all semester: Phineas Taylor Barnum (1810-1891): inventor of the freakshow, huckster, promoter, entrepreneur, hoax artist, mayor, state representative, and of course, founder of the circus as a uniquely American industry. We’re coming at him from multiple directions, bringing all the critical thinking and textual analysis skills we’ve built this semester to bear on making sense of his life, legacy and larger cultural meaning. Let’s begin on Tues 11/4 with a scholarly essay on Barnum’s “Theatrical Selfhood” (PDF). Also take a look at the current Wikipedia entry on him (don’t forget to consult its discussion page), noticing especially the sources used to build the page. How reliable would you judge these sources to be? For Thurs 11/6, we will read Barnum in his own words (which you by now have learned NOT to take at face value!). I also want you to hop over to this link and listen to 4 “Memory Palace” podcasts of your choice. Nate DiMeo’s carefully crafted audio storytelling series is the model for your own podcast project, so get a feel for how he does this: a brief, well-scripted, compelling story incorporating sound effects and music, with polished editing and sound production. Thurs 11/13 Workshop on Making a Podcast. Bring a laptop to class with either GarageBand or Audacity fully installed and ready to go, so we can play with the software during class. History Lab #5 (Film) is due. From 11/18 to 11/25, we’ll work in class using laptops and our Barnum book collection to conduct research, sketch out the chapters in our podcast, write, record, and work on making and editing the episodes. Peer review of script drafts on 11/25. Our last day of class is Tues 12/9, a course wrap-up day; Course Reflections are due, and we’ll have some time for course evaluations, discussion and feedback. These readings are in preparation for our class screening of one of the most unique and strange films ever to come out of Hollywood, from director Tod Browning (who also directed Dracula in 1931). Freaks is bizarre and disturbing but also fascinating and absorbing – not only as a primary source of the 1930s and of the world of sideshow attractions, but aesthetically as an early horror film centered on a traveling circus’s freakshow and featuring some of the most famous freak show performers of their time all in one film. We will screen the film in its entirety on Thurs the 30th – come ready to take notes, and also come ready to be amazed it was ever made. PS: If you want to read the short story on which the film was based, you can find it here. 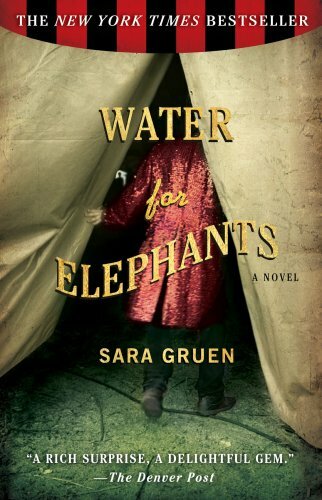 This week and next week we’re reading Sara Gruen’s novel, Water for Elephants. We’re looking at it for what we can learn about circuses and/or American life in the 1930s. We’re critiquing her research and her writing, weighing how aesthetically successful & historically authentic the novel is, based on what we now know about traveling circuses at the twilight of their reign over the American cultural landscape. Along the way, you’re working on History Lab #4 using this novel, possibly taking up one of the suggested questions for analysis, or developing your own question on a historical aspect of the book. For TUES 10/21, read up through the end of Chapter 10 (p. 141) and prepare to discuss its portrayal of circus life (contrasting it to Davis’s nonfiction account from Circus Age). I recommend taking quick notes on each chapter to make sense of the narrative and keep track of the plot. Tues 10/28, History Lab #4 is due. I will introduce film studies concepts with something we will read and discuss in class (nothing to prepare ahead of time), and that will bring us back up to the syllabus as originally printed. This coming week, we continue reading Davis’s monograph and talking not only about her findings, but about how to approach academic reading in general, in preparation for your “How to Read a Scholarly Article” exercise. Tues 10/7 – Reading: Davis, Circus Age, Ch 3-5. Also: bring your chosen article that you’ll be using for your H-Lab #3, we will workshop them in class. Thurs 10/9 – Sin City (Las Vegas) – this will be an in-class film day, watching portions of the PBS documentary on Vegas. Due in class: H-Lab #3 Scholarly Article. Reminder: The Barnum & Bailey Circus will be at the DCU Center, show starts at 7 (arrive by 6:30). See you there! UPDATE Tues 10/14 – For Tuesday 10/14, we will be discussing Janet Davis, Circus Age, chapters 3-7. To help manage this large amount of reading material, I am going to assign groups* to prepare and bring 3-5 discussion questions for each of the chapters. We’re also going to play discussion poker, inspired by our viewing of PBS Las Vegas (I’ll explain Tuesday). *You do not have to work as a group – but I just wanted 3-4 people to be responsible for coming up with discussion questions on their own for each chapter. PS: Starting this week on F/X… how ironic and timely for us! They’re clearly mining the cultural territory of the 1932 Tod Browning film, Freaks, which we will study later this term. For this Tuesday 9/30, we will discuss the first two chapters of Janet Davis’s book, The Circus Age: Cultural and Society Under the American Big Top (up to p. 36). Chapter One, “Circus Day,” describes how the big traveling circuses of the late 19th and early 20th centuries arrived in towns, set up, paraded, performed, and how local people learned about and responded to their arrival. In Chapter Two, Davis introduces the scholarly and theoretical questions her book will be concerned with, and what she calls the “ideological content” of the circus (25). Is the ideological content she identifies the same, or different, from Bogdan or Adams’s analysis of the freak show as cultural spectacle? Be prepared to describe Davis’s conclusions with respect to the circus as a HISTORICAL process and as a CULTURAL one – and keep in mind the ways that these processes intersected with, overlapped, or contradicted those of the freak show and other forms of American amusements. In our next two classes, we will get a rough historical background and some theory behind people who were exhibited as “freaks” in sideshows, circuses or dime museums – a theme we will return to later in the course. There are two readings for each class next week, one you can skim and the other should be read more closely. They are all posted on Blackboard (or will be, by Friday morning). At the same time you are working on the close reading of one photograph from either the circus or sideshow collections; that assignment is due on Thursday 9/25. The readings are designed to help you make sense of the photographs and to provide some context for what might otherwise seem like bizarre, exploitative or voyeuristic images.